This quilt was technically finished in August, but I’m just now getting a chance to post it to the blog. During the summer, Shannon Page did a webinar on taking traditional blocks and modifying them to have a more modern aesthetic. This was particularly well-timed as the Ontario Museum of History and Art (in Ontario, California) had put out a call for entries of quilts with a modern twist on traditional designs. I knew I wanted to enter something, but I wasn’t sure what to make. Setting aside the whole “what is modern anyway” thing for the time being, I made a list of blocks I thought would be fun to play with and narrowed it down to two: Bear’s Paw and Irish Chain. Using the techniques that Shannon discussed in her webinar, I played for quite a while and came up with a number of variations. Eventually I realized that I needed to actually decide between them all and make one of them. Given the lack of time and my other deadlines, I decided to go for one of the smaller Bear’s Paw designs. I’d still like to revisit some of the other variations when I have a chance. 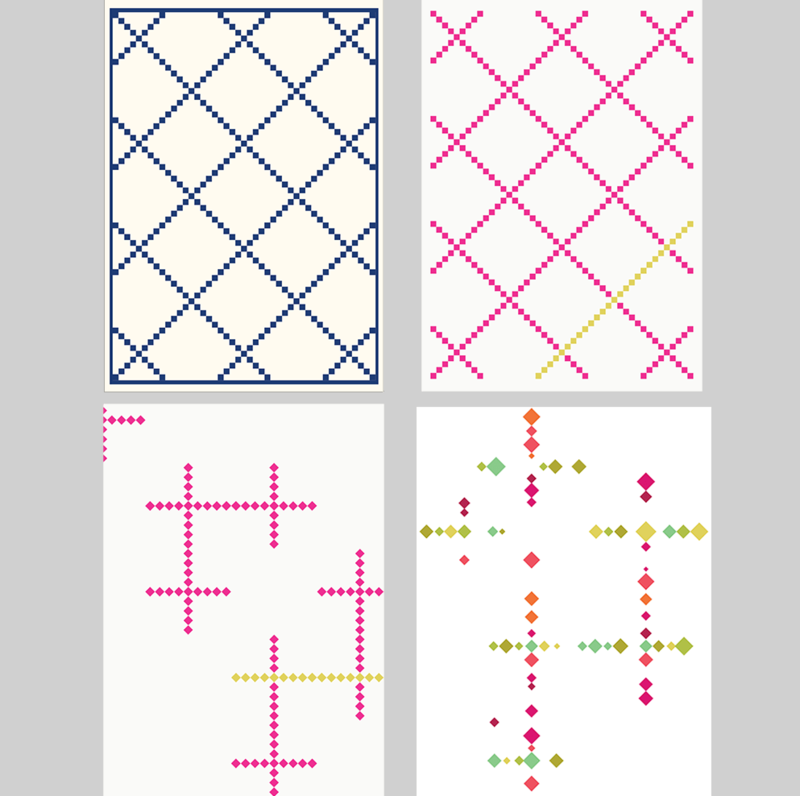 Design wise, I really love playing with foreground and background (something I discovered while doing the whole Quilt Design A Day thing) and I’m pleased with how this particular design brings the attention to the secondary shapes between the blocks. 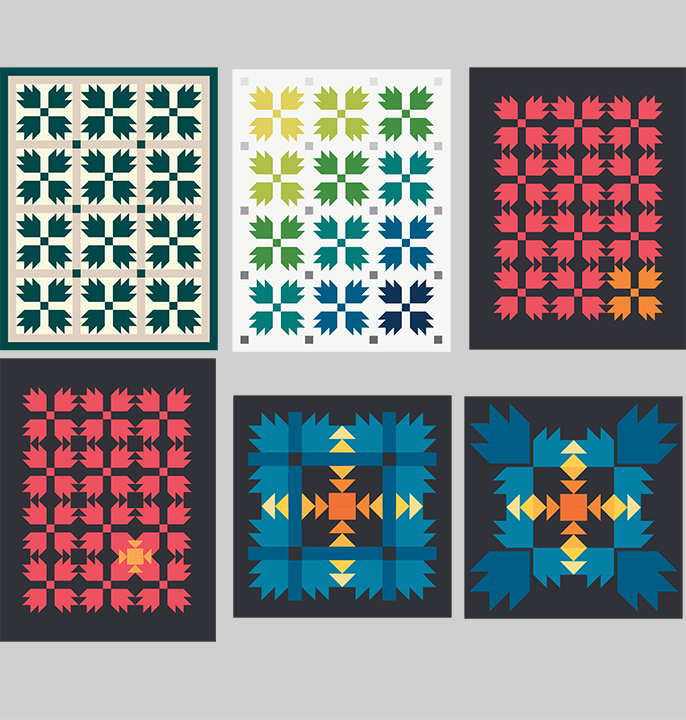 After a bunch of waffling, the final coloration was decided based on the fabrics I had on hand. Woohoo, pragmatism wins again! 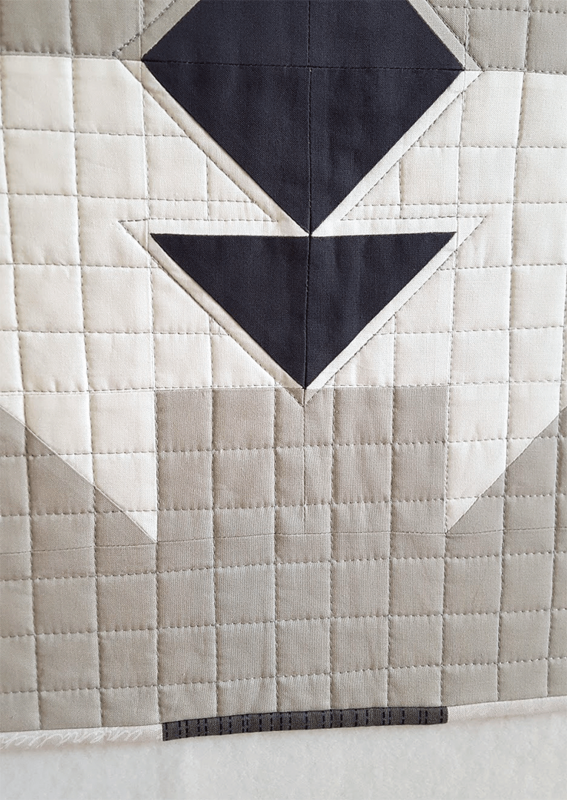 I chose to do a grid-based quilting because the secondary shapes reminded me of a compass star. The grid felt like a way to continue the map theme and I echo quilted around the secondary shapes to help bring even more attention to them. Referencing the compass star, I chose to name the quilt Ursa Minor because that is the latin name of the little dipper constellation (literally: Little Bear) and the north star is in the Ursa Minor constellation. And of course Ursa for the Bear’s Paw block, and Minor because it’s a fairly small quilt, and man do I like my silly naming puns. 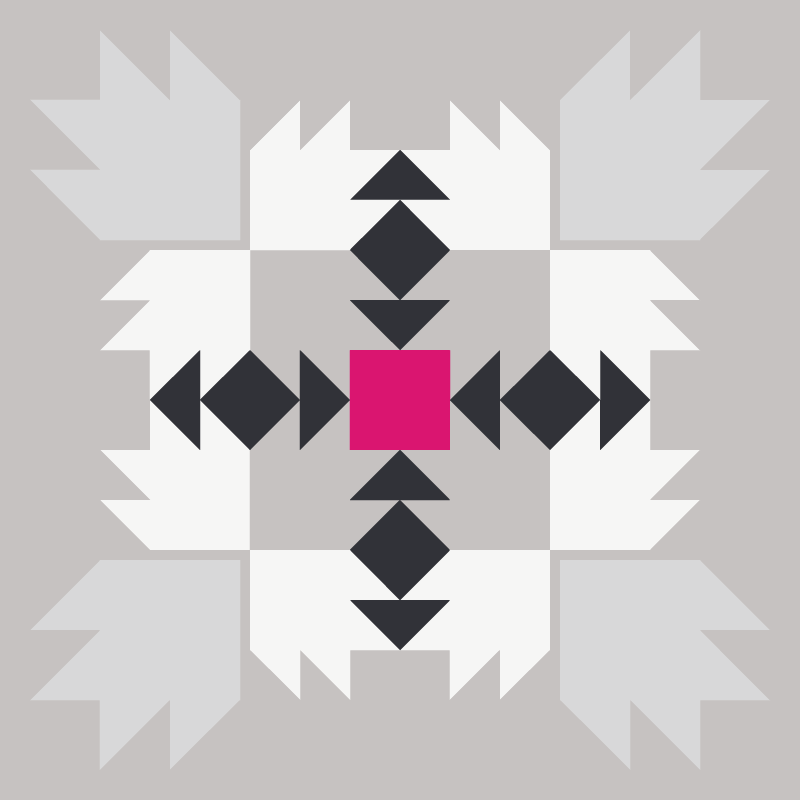 As an exciting footnote, the quilt did get into the exhibit, so it will be showing in the Modern Quilts: Redesigning Traditions exhibit at the Ontario Museum of Art and History between December 1, 2016 and January 22, 2017! Fabrics: Kona: Snow, Ash, Pomegranate, Charcoal. Dear Stella: Stirling. Binding: Prints from stash which I don’t know the name of. Modern: Does this qualify as modern? I don’t know and it’s not something I’m particularly fussed about. I just make the stuff I want to make and I’ll let some art historian figure out how to label it a few decades from now if it ends up being worthy of a label. Love those designs! Congrats on being accepted into the exhibit–I thought it was in Ontario Canada at first & was super excited it would be near me (alas, it is not). Thank you! And to be honest, I thought it was Ontario, Canada for quite some time until someone else pointed out it was “the other CA”. Haha! They must get that a lot. 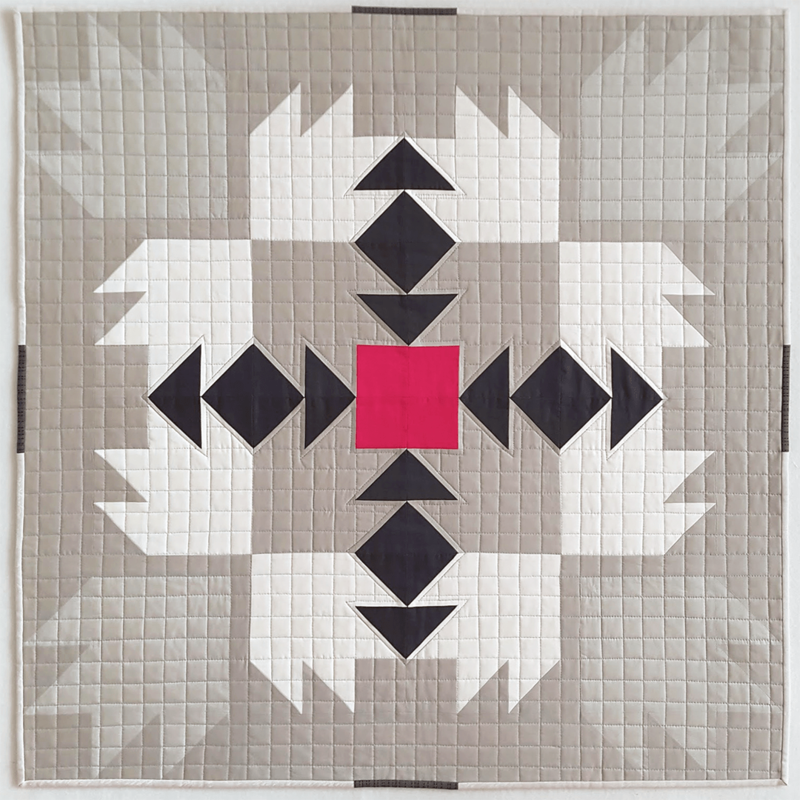 I love the connection to a compass, the sky, the traditional block, and the final quilt name: perfection! Thank you, Yvonne! I normally have a really hard time naming things, but this one (when it finally came) immediately felt right. 🙂 It’s a lot of different concepts but it unites them nicely! I see a native American motif here. Look at some of Pendleton’s designs. Clean, crisp, eye catching, (I love bears), and I like it! Lots! Congrats on being juried into the show. Thank you! A friend of mine was just telling me about Pendleton blankets, I’d never heard of them before and now here they are again. 😀 Thank you so much for the congrats, I was so pleased when it was accepted! I’ve seen some pictures of some others that were accepted and it looks like it’s going to be a great show. Love this design – and congratulations on it being selected for the Ontario show. I very much enjoy reading about how you plan the things you make. Thanks! What a perfect little quilt. I don’t usually play with traditional blocks, but you showed you can take them and make something totally modern and different! Congrats and thanks for the reminder and inspiration! Looks great! I really love some of these layouts you came up with! Wow. I’m in awe of your creative ability. 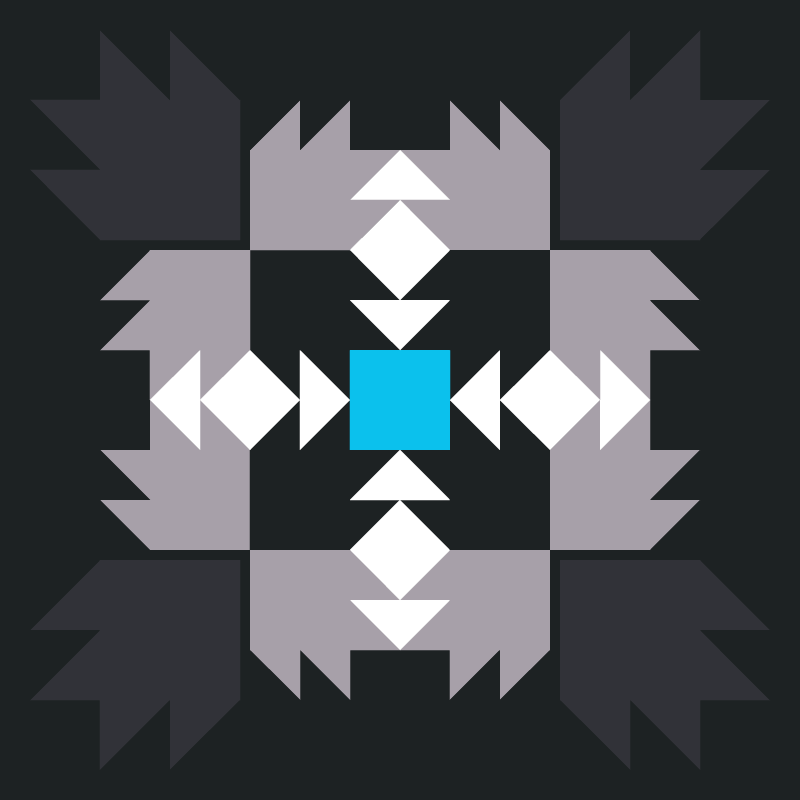 I’ve never really liked the bear paw block, but you have made it so interesting to me now with this unique snowflake – star- constellation look. Very intriguing and I have to consider making something like it, but with a twist on the colors, of course. BTW, your Phoenix quilt to me looks like it has a lion face on it. Do you see that, too? I always enjoy your improvisations. 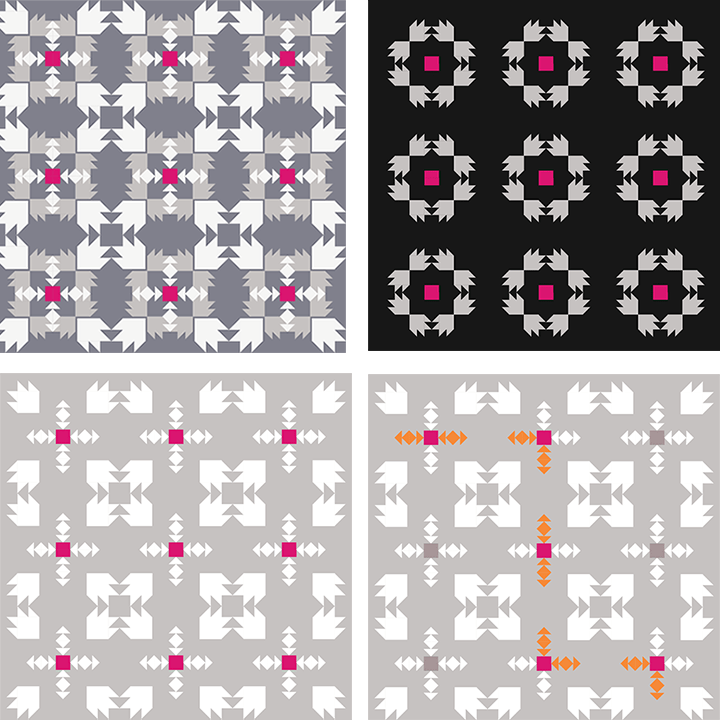 May I show some of these when I do a talk about modern quilts in November? How flattering, I’d be happy to let you show them! Please feel free to use whatever you want. 🙂 Where is your talk? That’s pretty exciting! Congrats on getting your quilt into the show! I love the quilting, especially the way it looks thoughtful. I say that because you went around the big dark spaces on point rather than going through them. It was not as easy as going through them, I know, but very effective. I love the way you showed some of your design process. Thanks!